As night approached at a wayside inn, the holy Reb Zusha of Anipoli retired to his room. But instead of going to sleep, he began his evening routine of study and prayer. 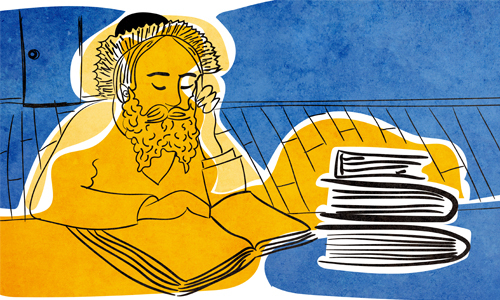 Murmuring quietly to himself over his books, he spent hours communing with the Divine and praying for the safety and security of the Jewish people. Who could possibly resist such a juicy invitation to eavesdrop? The innkeeper made himself comfortable in the hallway and settled down to enjoy the details of his guest’s confession. However, to his absolute shock and growing dismay, the “sins” that Reb Zusha started enumerating began to sound more and more familiar. He himself was guilty of every bad deed that his guest described! The innkeeper could feel his long-buried conscience begin to stir, and unaccustomed feelings of contrition started to cascade through his body. Without even realizing it, he too began to weep. For the first time in his life he truly begged for G‑d’s forgiveness and resolved to change for the better. As he sobbed out loud, the door to Reb Zusha’s room slowly opened, and the tzaddik welcomed him into the room. Was the holy man lying? Reb Zusha was endowed with Divine revelation, and used this awareness to awaken people to teshuvah. He didn’t need to go through this charade to make his point; he could have sat people down and given it to them straight, revealing the details of their transgressions and how to repair the damage. However, it is far more effective to move someone in the right direction through empathy than with anger and recriminations, and Reb Zushe was willing to be thought a sinner just to help another. When we describe, in this week’s Torah portion, the mitzvah of confession and the sacrifices that a sinner offers on the altar in the Temple, we’re talking about actual sins, not vicarious confessions and imaginative self-incriminations. Reb Zusha was clearly innocent of the litany of sins that he described, so why did he plead guilty? What right did he have to lie? When I see wrong, I’m looking into a mirror. There is a well-known teaching of the Baal Shem Tov that when you see someone else sinning or doing the wrong thing, it is a heavenly sign that in some way you are guilty of a similar crime. You were shown the deed only so that you would reflect on your own behavior and repent. Don’t judge. Never criticize. Although your instinctive reaction might be to look askance at the perpetrator and condemn him for his failings, G‑d is really doing you a favor by revealing to you your own character flaws. You might not have done exactly the same sin. Your sins and struggles are unique. Yet in some subtle way you have struggled with a similar temptation, and you too have been found wanting. When Reb Zusha would openly “confess” to the sins he perceived in others, he was recognizing the fact that he too, on his own level, was flawed. He too had faults to overcome and imperfections to rectify. He may not have been guilty of the gross misbehavior of his host, but even a man of his caliber and spirituality can, and must, constantly strive to improve. And that is why Reb Zusha was so successful in drawing people close to G‑d. People can sense sincerity when confronted with it, and they know when you’re just putting on a show. Reb Zusha was not crying crocodile tears of fake piety and trying to trick the other guy into repenting. He truly believed that he was the guilty party, and he truly resolved to change. When we are confronted with sin, rather than look away in judgment or glare in condemnation, we must have the strength of character to recognize that we too are imperfect and need to change. And then, once we’ve worked on ourselves and resolved to become better, we have a responsibility to reach out with love, to help others cross the same divide. “My friend, it seems we both have sins of our past that we regret. Come, let’s do teshuvah together . . .” To me this article puts some readers like me in a crossroad; one path leads to find a Rabbi who instruct us on how to do teshuva; the other path lead us to find a way to do teshuva by ourselves. But the first things we have to have, are our sins, sins that we regret and that that we have to acknowledge before G-d. Only then, we will be able to begin teshuva. Where did you see "the mitzvah of confession and the sacrifices that a sinner offers on the altar in the Temple" in this weekly portion of Chukat? So far as I can visualise, Reb Zusha had attained that level of cosmic consciousness where the difference between I and thou is completely destroyed and one feels unity with the whole universe. In such state of divine consciousness, Reb Zusha must have forgotten his own identity and must have identified himself with the innkeeper and have "known" all the past, present and future of the innkeeper. Since at that moment he was feeling himself in unison with the inner feelings of the innkeeper, it was natural for him to repent for all the wrongs done by the innkeeper as if these wrongs were done by Reb Zusha himself. Therefore, he was not lying at all at that moment but expressing his genuine feelings. It was only when the innkeeper's wail brought him back to the worldly consciousness, that he invited him to repent together. Actually, such great saints like Reb Zusha are beyond all good and evil, with no desire for any thing except the G-d.